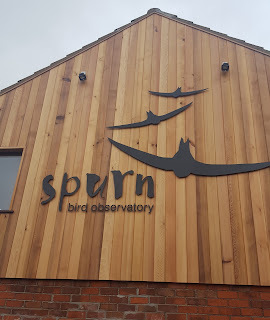 The weekend just gone was a Bank Holiday for Easter, allowing me 4 days off school, and it just so happened that the weekend clashed with the Spurn Bird Obs opening event, something I had been looking forward to for ages. The people at Spurn have been really supportive to lots of young birders. Last year they ran the first Young Birder of the Year competition during the MigFest, giving up their time to support me, Ellis Lucas and Evie Miller. They have also given lots of identification tips on certain species, and even offered us all a 3 night stay at the Observatory for taking part in the Young Birder Competition. The main reason I was at Spurn was to give something back to them, to show how grateful I am for their support. I wanted to congratulate them on how far they have come with the new Obs. It looks absolutely amazing and everyone there who helped out has put an extraordinary amount of effort in to it. We (me and Mum) set off for Spurn at about 11am with a 3.5 hour drive ahead us. I really was so excited about this trip, especially after the experience at Migfest last year. Due to Spurn being so far way from where I live, we decided to stay for a couple of days rather than just the Sunday which was when the actual opening was. 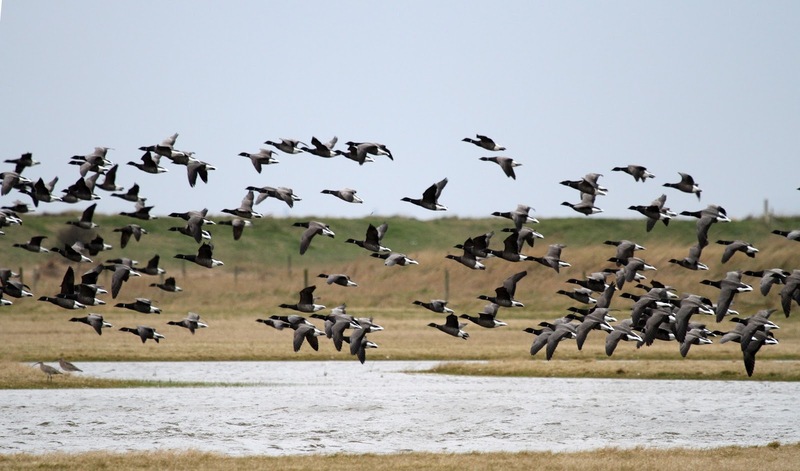 Spurn has one of the biggest bird lists in the country, so you never know what might drop in. We arrived on Saturday in the afternoon which left plenty of time for some birding. 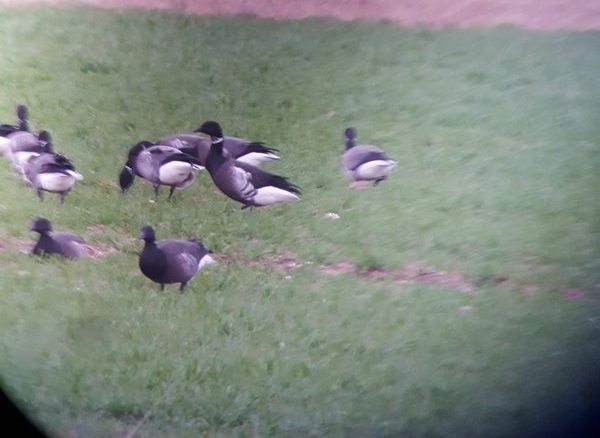 There were a few nice species around, so once we arrived, we decided first of all to have a look for the 2 Black Brant that had been seen with a large flock of Dark Bellied Brent Geese. 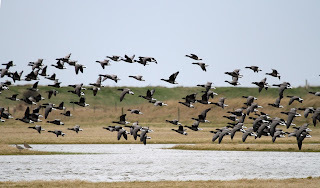 We managed to locate the flock in a flooded field opposite Kilnsea Wetlands and began trying to pick it out. There was a really helpful man who found one of them and pointed it out; it was to the left of the flock where I soon got onto it. They're a striking bird with a thick neck collar which goes all the way round the top part of neck. They also have a white flash on the flanks which contrasts with the darker color a lot more than Dark and Pale Bellied Brent Geese. It was an absolutely great bird to see, however I apologise for the picture as it's a bit blurry; things were really difficult considering the awful wind which was shaking the scope and making phone-scoping a bit tricky. After a successful look at the Brents, I decided to do a bit of afternoon sea watching which produced a Great Northern Diver and several Red Throated Divers. I also managed to catch up with some NGB birders including Matt Bruce, Liam, and Beth Aucott who were great to talk to over the course of the event. Sea watching wasn't producing too many birds (we did get a seal though) so after half an hour or so I decided to call into the new observatory to see what it was looking like. From the outside it really looks amazing and is located next to the Humber estuary, so the views out of some of the obs windows were absolutely stunning. There are several house rules in the obs to keep it looking great, and I managed to stick to most of them. Once inside I was greeted by several of the people who took me out for my Young Birder tests last year at Migfest. It was great to catch up with these people and have a chat, I also managed to finally meet Jonnie Fisk another NGB person and a great and funny guy to talk to. After a bit of a catch up I investigated all the rooms which were fantastic. The whole place sleeps about 13 people and is really cheap to stay at as well. Some of the rooms viewed the estuary and some viewed the massive garden they have, which had it's first rare bird on the Sunday which was a Firecrest. Since it was just a quick look around, next we decided to check in to the place where we were staying, Westmere Farm. On the way we pulled over to watch a small flock or Curlew feeding in one of the paddocks. By this point it was almost 6pm so we decided to go up to the Crown and Anchor Pub for something to eat where we were joined by all the NGB people I have mentioned above along with Lizzie Bruce, Nathan Pickering and Tim. It was a great way to finish the evening and I couldn't wait for what Sunday would bring. I had set my phone alarm for 6am in the morning, as I wanted to do an early morning sea watch before the main Obs opening; however before all that I was treated to the one and only Westmere Farm cooked breakfast which was delicious and filled me full of energy for the remaining day. I arrived at the sea watching hide at about 7:30am where all the people from the previous evenign were. It was nice to do a bit of birding with them even though the main birds we saw were Wood Pigeons. Sightings wise we did get a couple of Red Throated Divers (one of which was close in giving nice views), several Common Scoters flew south and 15 Kittiwakes were nice to see. The highlight of the session for me though had to be a single Fulmar which flew past. I also managed to meet up with another young birder who I had never met before, but spoken to online via twitter. This person is a great Yorkshire birder named Darragh Hudson, a great guy and really nice to meet up with. We did a bit of birding together later in the afternoon along with a good birding friend of mine Ellis Lucas. The rest of Sunday morning was pretty much all out birding for me, and after the session of sea watching, me and mum had a quick stop at Kilnsea Wetlands to see the Avocets. Next we went a little further a field to Sammy's Point to try and see the Firecrest that had been seen for the last couple of days. We arrived at the car park and walked a short distance along the coast to the horse paddock where it had been seen. On the way was where I first saw Ellis and his dad over the weekend. We had a quick meet and greet before departing from each other knowing we'd catch up later. The fields around this area held small group of deer. Now then, the area where the crests were was a lot bigger than I expected so finding it involved a lot of walking round scanning every tree; however I managed to pick it up with the help of 2 other birders. 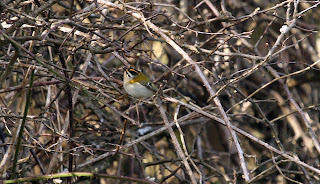 The bird was seen on and and off, flitting about in a hawthorn with a Goldcrest. At points it showed really well. After this success, we headed off to the new Spurn Observatory for the official opening. When I arrived the building was already filling up and I was glad to get in and chat to some people before the space became a bit to cramped. It was good to finally meet Mike Dilger who gave a great talk about the success of the new obs and how he had a great relationship with Spurn. He's a really nice person to talk to and always has a positive attitude to everything. Mike was also the one to officially open the Observatory by raising the cloth from over the plaque attached to the new building. There was a great turn out for the opening of about 250 people, which obviously showed how much people support the observatory. After the official opening it was nice to catch up with some other people including Paul Stancliffe, Stuart Pike, Brian Egan, and many others people that I'd met at Migfest last year. I also met and spoke to lots of new people, including some young people which was great. I decided to spend the remaining afternoon doing a bit of birding with my young birding friends that were at the event: Ellis Lucas and Darragh Hudson. 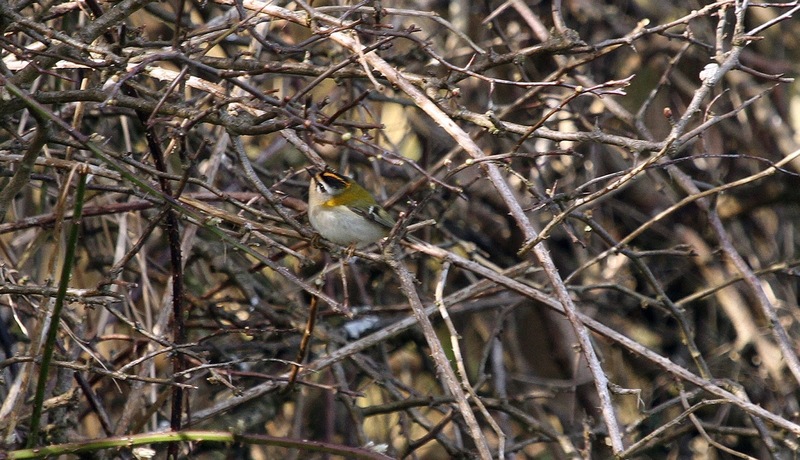 We first decided to walk to Sammy's Point to see the Firecrests again as they are such a stunning bird; we immediately clocked them, and happily showed them to Ray Scally and a few other birders. Unfortunately by this point it was now getting late and was time for me to head back to the pub for a meal before I left Spurn. I called in to the Obs on the way back to say my good byes and once again congratulated them for the success of the new Spurn Observatory. As we were leaving Spurn, we witnessed a stunning flyover by a Marsh Harrier. A great way to end a brilliant weekend. 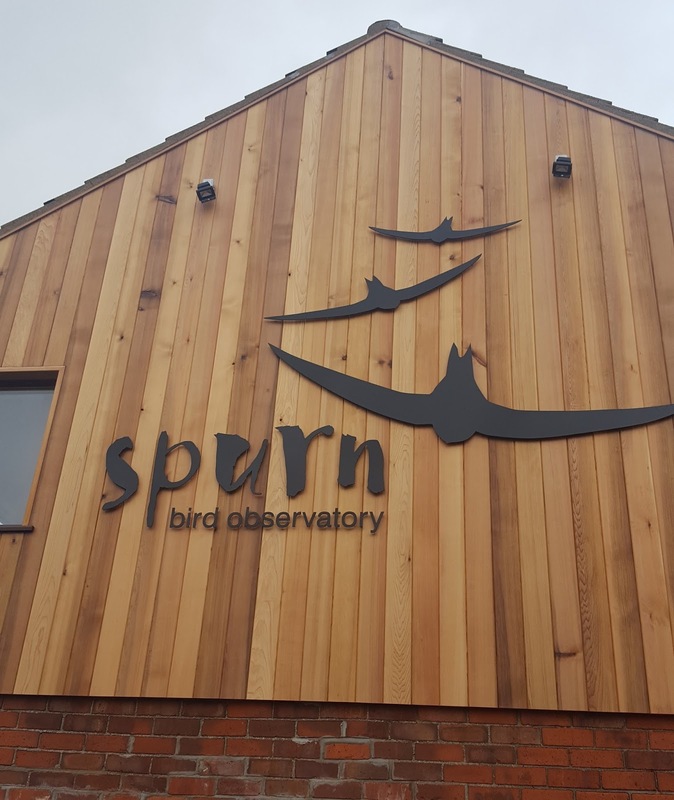 I am looking forward to getting back to Spurn again soon, and hope to bring you some exciting news on the 2016 Spurn Young Birder of the Year Competition soon. We are now half way through the sign up part of the #Think500yearsAhead Thunderclap. In just 31 days, on 19th April, a tweet will go out from as many people as possible asking MPs to think much further ahead than just a 5 year term. Sometimes there just aren't enough words to explain why something matters so much, so I have made a video to try and reach out and show people just how important it is for our MPs to think further ahead, and have the natural world, that we all take from, at the heart of their decision making. A massive thank you to the 444 people who have already signed up. But there is still plenty of room for more, so, if you have a Twitter account, please sign up by clicking here. And please spread the word to everyone you know. Sunday was certainly an action packed day. It started with a fantastic ringing session, but more on that in another blog post soon. After a great morning ringing, we headed from Lancashire, back through Liverpool and the Wallasey Tunnel to the Wirral, as Sunday afternoon was all about Hen Harriers. Sunday was the last RSPB Skydancers on the Dee event for now, as very soon the Hen Harriers will be making their way back to the uplands for the breeding season. The Donkey Stand (the usual place where we set up) was taken by workmen who were repairing/improving that area for the public, so this time we were raising awareness at The Boathouse/Baths end of the promenade. The views down that end across the salt marsh are just stunning, however, you don't get quite as many people walking past to engage with. Visibility was great and the weather was Spring-like, despite the cold, however I didn't pay much attention to that, as I was entertained by the vast quantity and quality of bird life on offer. I was also catching up with Elliot Montieth and the RSPB's Katy who was in charge of the event. The first bird of prey encountered was a self found Short Eared Owl. It flew really close in to where we were, being only about 10 metres away from the wall at one point. I just watched it, totally engrossed and didn't even think about pictures. Sadly by the time Elliot got into a suitable position for getting a picture, the owl had gone a bit to further away. He still got a great record shot though. As the day progressed, it became clear that it was going to be all about raptors. Including a couple of species seen in the morning at ringing, my raptor total for the day was 7; Merlin, Peregrine, Short Eared Owl, Hen Harrier, Kestrel, Buzzard, and Sparrowhawk. The Merlin was a stunning adult male and came quite close in to get some amazing views through the scope, as did the ringtail Hen Harrier that flew past a couple of times, also allowing some great views. Some people had traveled from Derby and some from Bristol to see their first ever Hen Harrier. It was just fantastic being able to show them such a great view of the ringtail and I hope that is a memory that will live with them for a long time. So what now for the Dee Estuary Hen Harriers? Well hopefully they will survive their journey to the uplands and then get to skydance before raising successful broods. Well that's the dream anyway. With so much against them, they need all the help and awareness we can raise. If you are concerned about our natural world, maybe you could join my Thunderclap campaign to get MPs to think much further ahead when making decisions that impact the environment. You can join the campaign here and help shout out the message together, as one, on 19th April. We all have a responsibility to speak up for the natural world. Sparrowhawk Microwaves Blackbird - or so it seemed! "We left the door open while we we taking shopping into kitchen, when in came a Blackbird followed by the Sparrowhawk, which took it out of the air. It tried to leave via the window, sadly closed. It dropped the bird and landed where you see it. I picked up the dead blackbird put it on the sill and opened the window. It left without the bird." @WildeAboutBirds @nybirdnews Baking four and twenty in the microwave? 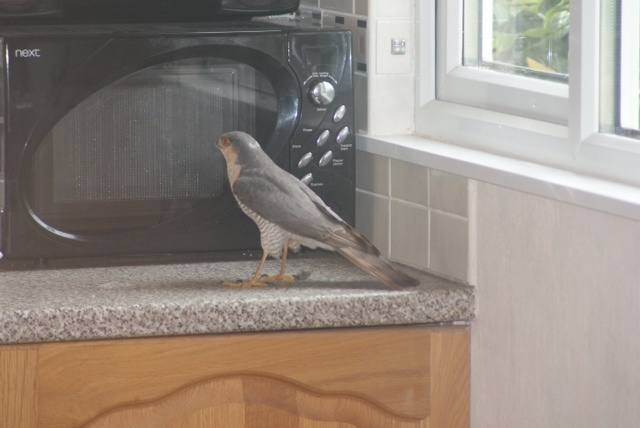 New research shows that in times of prey shortages, Sparrowhawks will resort to eating microwave dinners. 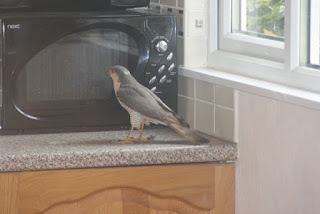 Sparrowhawk deciding what setting to put the blackbird on now it has got it into the kitchen. So over to all of you, what so you think the Sparrowhawk is thinking?